This plant, the lovely Shooting Star, in all its white splendor and glory cheers us up here at HydroSpike. 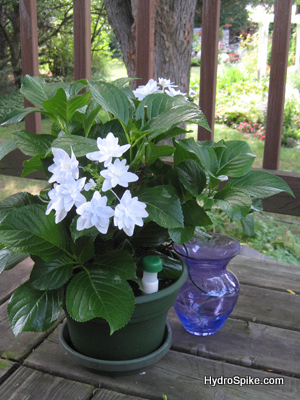 This plant cannot be under harsh sunlight, and definitely needs watering in warmer weather. If you are busy, on vacation (or holiday), be sure to set up a HydroSpike system so you will come back to its beautiful blooms. It starts to bloom less towards the end of summer. For all you married men, the shooting star plant is a perfect gift to give to your wife…she is your shooting star.